Where I Got It: BN.com was a having an amazing summer clearance sale...got this book for $1.99! The Truth about Forever is about seventeen year old Macy Queen. A year and a half ago she lost her father to a heart attack. Ever since then Macy strives to be perfect. Her hair is always perfectly parted in the middle, her clothes are always perfectly ironed, she has the perfect boyfriend and she gets perfect grades. Macy has her whole summer planned out. During the day she is taking over her boyfriend's job at the library information desk while he is away at camp. At night she will study for the SAT or attend a yoga class. Her summer goes exactly as planned until she meets the staff of Wish Catering. They are the complete opposite of Macy: imperfect and chaotic. Macy surprises herself when she is offered a job with them and accepts. Throughout the summer the Wish Catering crew shows Macy that things don't always have to be perfect and that sometimes you just have to let things happen. Their catering jobs never run smoothly, there is always some sort of disaster. Anything from spilling wine on a guest to forgetting to bring the main course. Honestly, I don't know how Wish Catering stays in business. But they do, and it makes for an interesting read. I love the characters of Wish Catering. There is Delia, the owner of the company who believes that sometimes you need things to go wrong to make you appreciate when things do go right. Bert, who just turned sixteen and bought a refurbished ambulance as his first car. Monica, who rarely speaks in whole sentences, and usually just gives one word answers. Kristy, who always wears crazy outfits and Wes, the boy who makes art of out things he finds at the junkyard. 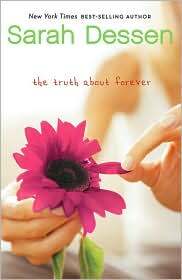 The Truth about Forever is a great pick if you are looking for a light summer read. I'm currently making my way through Anna Karenina so this book was a nice break from Russian literature! Great review, Jen! I read this book when it first came out, and just reading your review makes me want to pick it back up and reread it. Sarah Dessen rarely puts out a bad book. Have you ever read Someone Like You? Her book This Lullaby is one of my favorites. I have definitely read it over 10 times. That love interest in it is probably among my top fictional character crushes. Haven't read this one, maybe I'll check it out. Jess: Reread this book! I was flipping through the book looking for a quote I wanted to add but then I ended up reading a couple of chapters (and I never found the quote). I just read Someone Like You earlier in the summer. I really liked that book too! Paula: I definitely think I'll pick up This Lullaby. This sounds like just the book I need to read! I'm having a hard time trying to find decent books that catch my attention lately. I just finished reading a book that was SO good, that I feel like all of the other books I read, won't live up to that one. haha. But i'm definitely going to check this book out! Great review! I've never ever been a fan of young-adult books, but I adore hers! I think This Lullaby is my favorite followed by this one. I actually went to Sarah Dessen's website to look up her books, and read the first two chapters of this book. I'm hooked! I've got to catch up on some of the other books I've been reading and trying to catch up on, then I'm reading this!!! Stephany: I hope you can get your hands on this book soon! I read it in two days, I couldn't put it down! Kelly: This is my second Dessen novel and it certainly won't be my last! Daisy: This book is the perfect read for the beach! GMR: Exactly, this is a fun read that still teaches you some life lessons! Great review! I just downloaded this to my nook, can't wait to start it! The only Sarah Dessen book I've read is Just Listen, and I really didn't like it as much I wanted/expected to. However, this one sounds really good - I'm going to the library tomorrow and I will be checking it out! I listened to this on audio a few months ago. I thought it was cute, but it didn't have a huge impact on me. Good summer read, for sure, though.